Crown Lands and Government Lands, 1896. Under the Republic of Hawaii that stands now, the crown lands have been returned and added with the other lands of the government, and are referred to as government lands. Currently, the entirety of these lands are under the authority of a Commission appointed for that purpose under the law. The Commission is active today and its members are putting into order matters that pertain to their duties as per the laws. The finding of all lands that are not to be owned by someone, as well as the leasing, selling, and dividing of lands that are recognized as lands fitting to be homes for people without homesteads for themselves. This idea was devised by Mr. S. B. Dole while he was a member of the Legislature for a session under the monarchy. It seems that this was what he focused on, for the good of those without. He kept at this idea until it became law, amidst much skepticism by friends and fellow representatives. But he did not relent until he succeeded, and now he is working to move forward his loving idea for his fellow man, to increase, and to make prosperous, the poor people. Under his law and its revisions, this Government Lands Commission was created. At this time, the Commission is trying to carefully carry out their duties so that the lahui will not once again be hurt like under the benefits intended for the masses with the quiet land titles in the time of Kauikeaouli’s rule. They are surveying parcels from areas suited for a man and his family to live. The doors to this great right is opened and Hawaiians will receive land before all other ethnicities and then thereafter those from the outside. There are some Hawaiians taking advantage of this opportunity, along with some haole and other ethnicities. But the majority of those that know of the good offered up by this law are the people of foreign lands, the ones who know the value of land for which one is able to say that he is patriotic to the land of his birth. By this law, power is give to advertise land to those who claim land for themselves, under the condition that they cannot use it for profit. The land is available to those without land or those with wetlands of less than an acre under his name, or under the husband or wife in some other area of the archipelago; they will live on the land for six years after the request for land and should they meet the qualifications under the law, the applicant will receive a lease or 999 years. The requirements for the application and stipulations of the lease are shown in full in sections 31–54 of the Land Act of 1895. 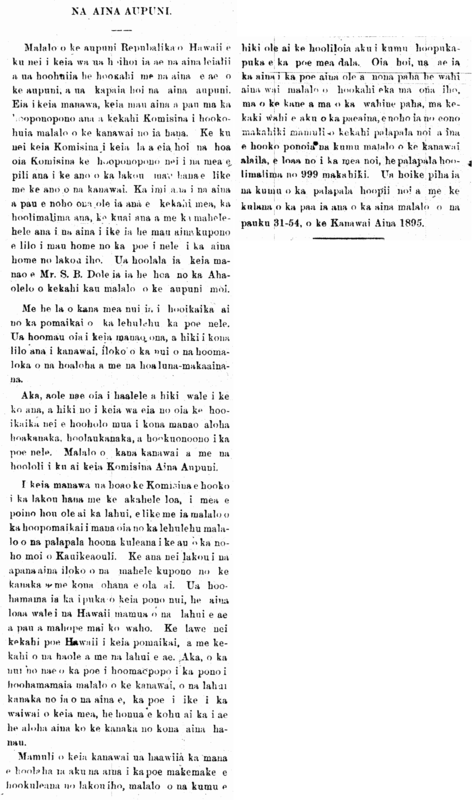 Ka Oiaio Puka La, Buke I, Helu 67, Aoao 2. Aperila 3, 1896.